MALE – Hosting an event in a marvelous place like the Maldives irrespective of size, type, and occasion will never be the same as Holiday Inn Resort® Kandooma Maldives inaugurates its new incentives and special events facility, the Kandooma Marquee. 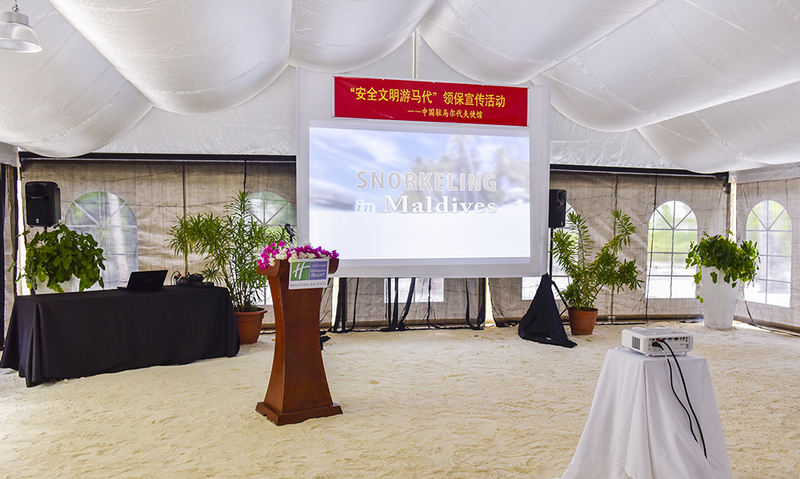 This Maldives resort, which is only a 40-minute speedboat drive from the nation’s Ibrahim Nasir International Airport has launched the brand new incentives and events venue with its maiden affair organized by the Embassy of the People’s Republic of China in the Maldives. The event which tackles about safety awareness topic was attended by the resort’s Chinese holidaymakers, embassy staff, and H.E Mr. Liu Qiang, Charge D’affaires, Embassy of the People’s Republic of China. 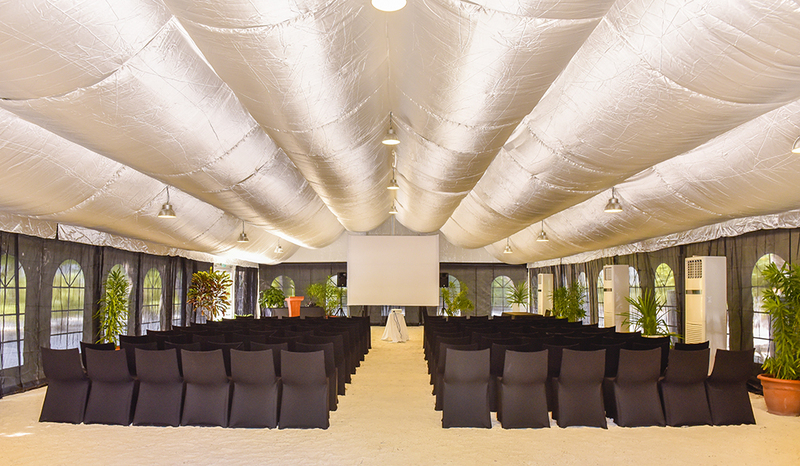 Featuring 200 square meter of movable events space, the Kandooma Marquee can host up to 180 guests comfortably. Local and international business companies looking to hold intimate incentives and special events or brainstorm sessions in a unique and isolated spot can take advantage of the resort’s state-of-the-art facilities, a large area for group or team building activities, multilingual speaking staff, resident doctor and nurse, and a specialized team professionally handling incentives and special events and group requests from planning to event execution. Incentives and special events planners, and organizers will have the opportunity to enjoy tastefully appointed decor, high-speed wireless Internet access, and advanced audiovisual equipment. When it comes to stimulating productivity, the Holiday Inn Resort® Kandooma Maldives features a variety of inspiring event menus to help ensure gatherings are extraordinary and delightful. Whether planning a sit-down lunch and dinner, or a simple coffee break, the resort’s professional culinary team is dedicated to bringing visions to life based on the client’s budget. After an active day of events, professionals can wind down in the resort’s ideal accommodations available in five categories – Garden or Beach View Villa, Beach House, Family Beach House, Overwater Villa, and the oversized Overwater Pavilion. Featuring well-appointed bedding, flat-screen television with premium cable channels, room service, mini-bar, spacious work desks and high-speed Internet access, guest villas allow visitors to stay be as relaxed or productive as they desire. Also present during the inauguration was Mr. Joseph Della Gatta, General Manager of Holiday Inn Resort® Kandooma Maldives. “The Kandooma Marquee, a new addition to the resort, is our response to the increasing demand of incentives and special events and group requests we are receiving across different parts of the world”, said Joseph. “With the brand’s commitment to provide memorable events through our seamless assistance from planning to event implementation, we are here to ensure that we help incentives and special events planners make their event a success”, Joseph added. IHG manages IHG® Rewards Club, the world’s first and largest hotel loyalty programme with nearly 79 million members worldwide. The programme was relaunched in July 2013, offering enhanced benefits for members including free internet across all hotels, globally.